The Jazz Fest app offers onsite navigating. The New Orleans Jazz Fest is not essentially a high-tech place. Sure, there are high-def screens flanking the stages, high-amp speakers broadcasting tunes to the crowd. But that’s (welcome) window dressing. 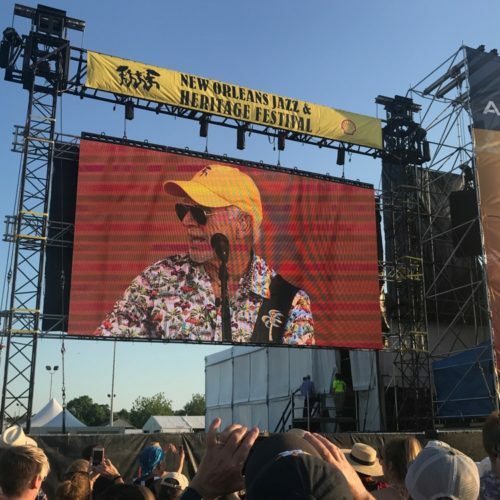 For most of us, Jazzfest’s allure lies in soaking up sun and sound, lying on a patch of grass and catching an opportunity to escape the urban landscape into a cloistered Fairgrounds infield. 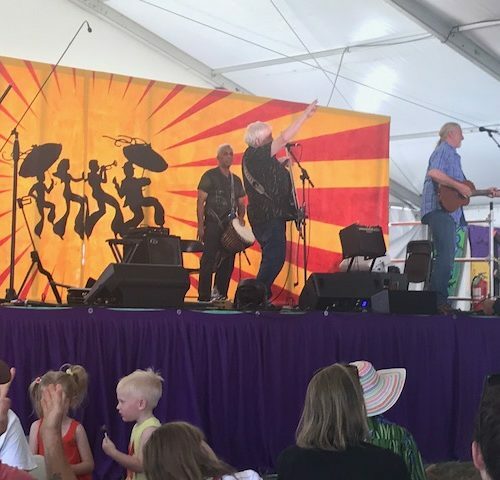 At Jazz Fest, bands give stripped-down performances that jettison backdrop videos and elaborately costumed dancers in favor of direct connections to the crowd. 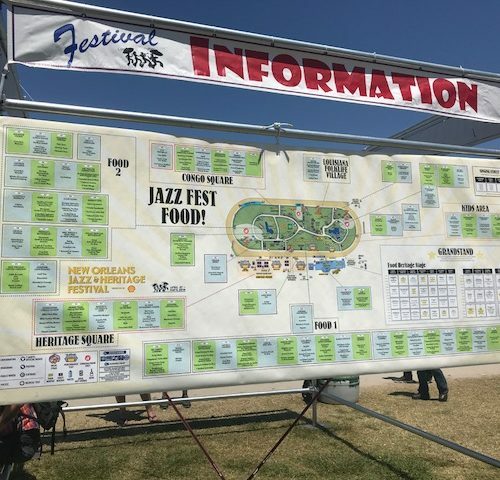 Perhaps that’s why Jazzfesters tend to be a little anachronistic – they carry around paper maps torn from print publications (who does that anymore?) and wear IDs on lanyards around their necks. There’s no flashing electronic entry scans on a smartphone here. You proffer a paper ticket and proudly display that brass pass on your chest. It is, however, the 21st century. Stage signs may still be hand-lettered with headliner names, but fest organizers haven’t ignored modern innovation. The Jazz Fest app has been around since 2010, and it’s getting more interactive all the time. I dipped a toe into that technology this year, ditching my paper map for the app. And I found that, even for old schoolers like me, sometimes electronic can beat acoustical. The Jazz Fest app is not for festival days alone – far from it. The scheduler and favorite functions allow for major advance planning. By clicking a simple plus sign, you can add bands to your personal lineup and foods and crafts to your must-do list. In fact, app users seem to salivate for this: The main criticism in reviews of the Jazz Fest app are that complete schedules (and thus the ability to personalize them) don’t come out early enough. Since the cubes aren’t finalized and published until early April, that’s a complaint that isn’t going to be addressed soon. For me, fest day functions are what whet my app-etite (sorry!). Sure, you can follow that pre-planned schedule on your phone, but live-time updates allow for spontaneous consumption. Pop-up notices at the bottom of the screen announce shows that are starting, and a direct click over to WWOZ radio allows you to tune in to the iconic station’s onsite coverage. Headliners, artists and food vendors all are searchable, in case you can’t recall when Cowboy Mouth is playing, or where the cochon de lait po-boy can be found. Bios and band links are a click away when applicable. You can link to social media, too, to update your status, tweet about bands or share photos. The app fills in band and stage names for you. But what I really like is the redlining. Bring up the current cube schedule, and a vertical red timeline indicates who is playing currently and how much time is left in each set. No more squinting at wrinkled maps, matching up column A and row B to decide if you have enough time to get from Gentilly to Blues before the concert there ends. That sort of functionality could enhance the Jazz Fest app experience in other areas as well. The two-dimensional flat map will probably one day be interactive, and I have no doubt that a GPS function will at some point allow you to map a route from where you are to, say, Crawfish Monica. A “find your friends” feature may one day make meeting at the flag pole passé. A few buttons seem to offer little of substance – no news for 2018 yet under News, and a few links, such as ticket info, simply send you to the website. But those are quibbles. The nice thing about the Jazzfest app is that it’s adaptable. Jazzfesters range in type, from those who plan every move in advance to those who wander around waiting for serendipitous moments. The app is a great tool for either approach. And, as with those high-def screens and high-res speakers, it enhances the experience without interfering with the environment. It reminds me of the Mardi Gras parade apps, which changed my life. No more waiting endlessly at the curb, when the app can clue you in on parade progress. 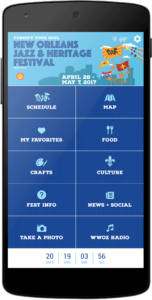 Likewise, the Jazz Fest app can help you maximize your time without minimizing the moment. Which is key. Because sun and sound should be front and center. Who wants to be glued to your smartphone screen when Aerosmith or Irma Thomas is performing live right in front of you? Jazzfest attire: Who wore it better?